What sets Calissanne apart is its topography, cliffs and hillside vineyards. At the heart of the estate, which covers 1,200 hectares (2,965 acres), there are 110 hectares of AOC Coteaux d’Aix-en-Provence vines and 60 hectares of olive trees – a single, handsome south-facing expanse of cultivated land. Hillside vines and plot selection. 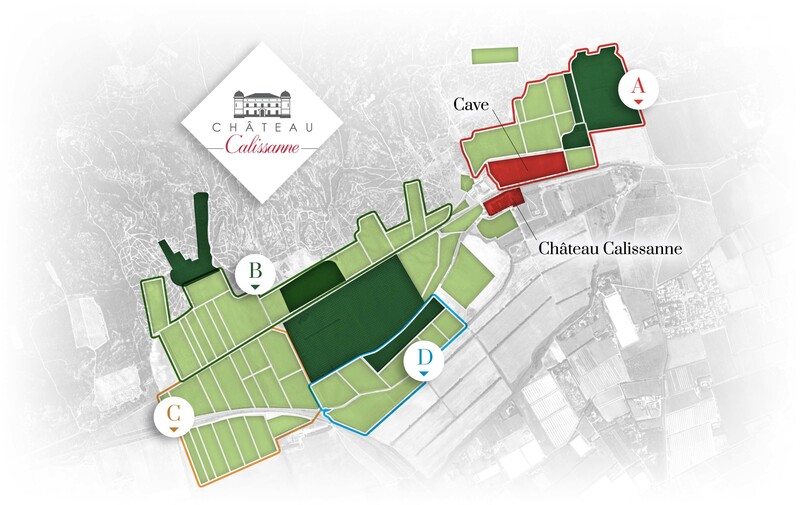 At Calissanne we work with four “clusters”, each comprising several plots (of which there are 25 in all). Plot selection was introduced to take account of terroirs and varieties. Les Fourches locality (cluster), located on a steep slope, south facing, with deep chalky-clay soil (chalky at the surface, clay lower down). Here, we cultivate a plot of Mourvèdre, in a spot called Rocher Rouge. The resulting cuvee, of the same name, is a mineral expression of this fine terroir. We also grow Syrah for the red-wine cuvées, Clos Victoire and Château de Calissanne. Les Chalets locality (cluster), also on the estate’s higher ground, south facing, on a slope, with stony and chalky soil. The main variety here is Cabernet Sauvignon, and the resulting wine in Clos Victoire. Sainte Modeste – La Gare locality (cluster), southwest facing. Production is limited here, yields are low, and the chalky-clay soil is shallow. With the Grenache and Syrah grapes grown here, we like to make our Château de Calissanne rosés. Chemin Blanc locality (cluster), in fine, light sandy-loam soils. A terroir perfectly suited to our fruity, rounded Terres de Provence wines. For the whites: Rolle, Clairette, Grenache Blanc, Ugni and Sémillon. In Calissanne’s special terroir, the Mediterranean climate – hot and dry (annual rainfall: 550 mm) – is tempered by the sea air, and bathes the vineyard in generous sunshine. Our vines are cultivated with care, with low yields the goal. The annual production mix at Château Calissanne is 50% rosé, 40% red and 10% white. A big effort has been made with red-wine production. A total of 40 hectares has been replanted over a seven-year period. In 2018 we will have a further seven hectares, with very fine Vermentino vines for our future white wines. The 110 hectares of vines and 60 hectares of olive trees at Calissanne are farmed in accordance with environmentally respectful practices. Our soils are aerated moderately but regularly. Observation lets us choose the right time. We reactivate our soils using organic fertilisers (fish excrement, a rich source of micro-organisms). We do not need organic inputs, as our soils are naturally rich.